Sony launches two new High Power Audio systems | What Hi-Fi? 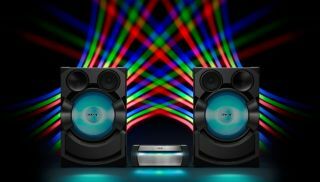 Sony's two new audio systems combine NFC wireless tech with colourful lighting effects and features designed to get the party started. Sony has launched two new audio systems and, if you're planning a party, they might just be right for you.. Both feature Smart High Power Audio technology and Mica Cone speakers, which intend to give you great sound quality with plenty of punch. And they also feature colourful lights that shine onto the nearest wall in patterns, and flash in time with the beat. Plus a karaoke mode, so you and your pals can butcher a much-loved classic without heading down to your local Lucky Voice. The MHC-V50D is the smaller of the two, standing just short of waist height. You can control the speaker's lights using the Fiestable app, and motion control lets you activate features, like the DJ function and sampler, with the wave of a hand. It also has a backlit touch-panel that lets you operate in dimly lit conditions. Such as a party. It's portable too, thanks to the carry handle, so can be lugged to someone else's house or out into the garden for a barbecue. Bluetooth and NFC are onboard for wireless playback from a phone or tablet. The Shake-X30D is the larger. It will work as a standalone system, or can operate as a 2.1 system for your TV. It packs the same audio tech as its little brother, plus dual microphone inputs allow for karaoke battles between you and a friend. You can also plug in a guitar and, like the MHC-V50D, you can hook it up to your TV and slot a karaoke DVD into the built-in player in order to see the lyrics on-screen. The MHC-V50D will go on sale in April for £420, while the Shake-X30D will land in May for £600.